Atlantic Monthly Press, 9780802126146, 447pp. After that fateful landing in 1492, the British, French, Spanish, Portuguese, Dutch, Danish, and even the Swedes, Scots, and Germans sought their fortunes in the islands for the next two centuries. Some failed spectacularly: a poorly executed settlement in Panama led the Scots to lose their own independence to England. The Spaniards were the first to find prosperity, in Mexico but also along the islands. In Hispaniola, Cuba, and Puerto Rico, they built grandiose cathedrals and extracted shipfuls of gold and silver, which English, French, and Dutch pirates were happy to seize. But precious metals weren't a sustainable export--the colonizers needed something that was, and they would need hordes of slaves to cultivate it. The Caribbean's first cash crop, one indigenous to the New World, was tobacco, and it, along with sugar, spurred expensive new addictions back in Europe. Gibson argues that immaterial exports were just as important. No other region of the world has experienced such a vibrant mixing of cultures, religions, and peoples--Africans, Europeans, Asians, and Amerindians created amazingly dynamic Creole societies that complicated traditional ideas about class and race. By the end of the eighteenth century, seventy thousand free blacks and mulattos lived in the British islands alone, and it was in the Caribbean that the world's only successful slave revolt took place--sparking the meteoric rise of Napoleon's black counterpart, Toussaint L'Ouverture, and the Haitian Revolution. The Caribbean island of St. Eustatius had been the first to recognize the United States as a nation, but the Americans were soon vying for their own imperial stronghold in the West Indies, attempting to control Cuba and backing influential corporations, most notably United Fruit. In the twentieth century, most of the islands broke from the imperial traditions that had lorded over them for four centuries: this would be the explosive age of decolonization and "banana republics," of racial riots and n gritude, of Cold War politics and tourist crowds. 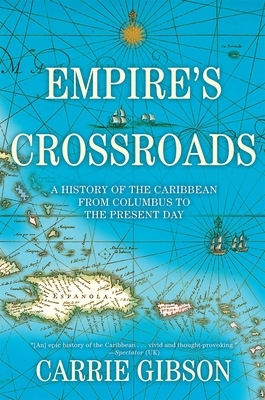 Carrie Gibson completed a Ph.D. at Cambridge University focusing on the Spanish Caribbean in the era of the Haitian Revolution, and for many years she also worked as a journalist for the Guardian. She has travelled widely across the West Indies, and spent many months researching in archives there, including in Cuba, Puerto Rico, and the Dominican Republic. She currently splits her time between New York City and London.